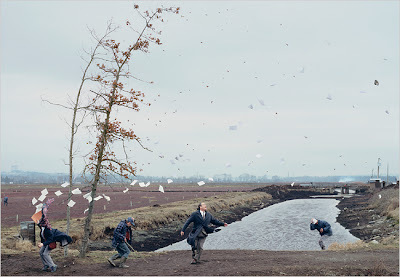 Jeff Wall is considered one of the most innovative and influential artists of his generation. 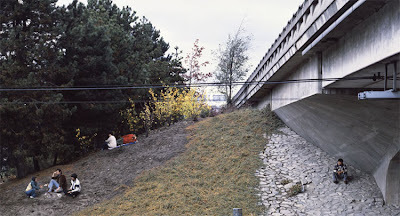 Although Wall's medium is photography, he is a conceptual artist whose career began during the 1960s. His work of the past 25 years consists primarily of large-scale, color transparencies mounted in lightboxes, and, since 1995, black and white photographs. Wall's pictures resemble both paintings and film stills, drawing the viewer into highly specific scenes that imply larger narratives. After 'Invisible Man' by Ralph Ellison, the Prologue (shown up top), represents a well-known scene from Ellison’s classic novel. It is one of Wall's most literal and satisfying compositions. Wall’s version shows us the cellar room, “warm and full of light," in which Ellison’s narrator lives, complete with its 1,369 lightbulbs. According to Ellison's narrative, the man has been in this forgotten basement since accidentally falling into it during a New York street riot. Wall draws our attention to the novel's protagonist, placing him at the far end of the cellar room with his back turned towards us, as well as to the illegally-connected light bulbs that illuminate the subterranean hideout. Energy and light, stolen from the electric company, illuminate not only the character’s basement dwelling, but also the truth of his existence. He tells us, “Light confirms my reality, gives birth to my form…. Without light I am not only invisible but formless as well; and to be unaware of one’s form is to live a death. I myself, after existing some twenty years, did not become alive until I discovered my invisibility. The truth is the light, and light is the truth." On creating this scene, Wall told The Guardian, "Writers have it very easy. They have the pleasure of imagining these scenes. 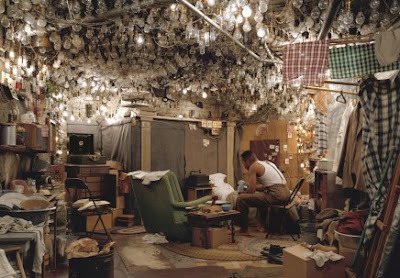 Working on that picture, I really learned about what Ellison's 1,369 lightbulbs means. You can only have a few on at a time. I got to know that room as well as the Invisible Man would have, had he existed." Writers, care to comment? Another tribute entitled A Sudden Gust of Wind (after Hokusai) (just above) transplants the scenery from Hokusai’s woodcut series The 36 Views of Mt. Fuji into the setting of British Columbia. Mt. 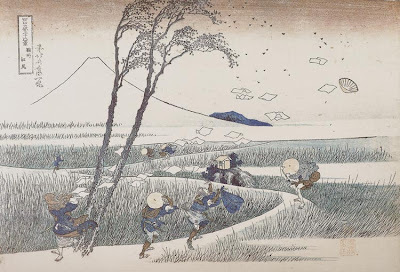 Fuji is missing, but the figures’ poses and the movement of a stack of papers in the wind make it easy to recognize the famous work Sunshu Ejiri (see below). Though a frozen image, this scene is far from static. This is not one frame in a sequence, but instead, it is a collage of movements and gestures. It is more than a photograph, less than a film, and astonishingly close to historical painting. It is a good example of Wall’s elaborate figurative works, which are hard to categorize, and it is this quality that makes them appear interestingly foreign. These works are not snapshots from life or renditions of organic processes. Instead, they are staged events, in which performers reenact lifelike situations with an exaggerated expressiveness. Wall’s early passions were painting and art history. His doctoral studies focused on John Heartfield’s photocollages. According to Wall, it was almost by chance that he discovered that photography contained the formal vocabulary he would use to channel his diverse interests. He made his first backlit color transparency in 1977 after riding a bus outside of Barcelona and passing an illuminated sign that had a lasting effect on him. By employing a technique that at the time was primarily associated with commercial advertising campaigns, Wall instantly entered contemporary terrain. He had found a format that had been mostly unexplored in the context of art and contained formal elements that could attract a consumer’s short attention span. Crossing mediums as Wall does -- photographing literature -- is not often done. As Peter Schjeldahl says, such literary tie-ins are "perhaps the single most despised genre in the lexicon of modern art." Really? This is news to me. I, for one, am utterly and completely fascinated by Wall's work, especially his Invisible Man. I wonder about the practical constraints of photographing more than 1,000 lights; I'm impressed with how lived-in the scene appears. The composition is powerful, full of telling detail. Yet the man himself, illuminated so brilliantly and obsessively, remains - ultimately and heartbreakingly - unseen, unknown. So, what think you of Wall's work in general? Is staging elaborate photographs of literary narrative equivalent to filming and refilming literature? Do these pictures enhance or detract from the mental images you've already envisioned of these literary scenes? Do you care? I'd love to know your reactions. :images nytimes, sfmoma, moma, tate modern; thanks to my great pal for sending the j. wall postcard that got me thinking about doing this feature post in the first place. I think they're fabulous and make one view the medium of inspiration with a different perspective. Great post - thank you! I think his work is fascinating, but I don't see his work as adding or subtracting from my mind's eye image. With just the visual, I'm more easily able to assimilate it as his work than I can when a film is made that incorporates sound and there is disruption to my sense of the dialog. Hello, a newcomer to your blog from “what possessed me”. A very interesting post about J Wall. But didn’t he want to make movies at the beginning of his career ? Never had the chance to see his work in vivo. The concept of making a photograph after a painting is always so appealing. I could watch endlessly Hokusaï painting and Wall's photograph and be fascinated by the dynamics of movements which are equally rendered. 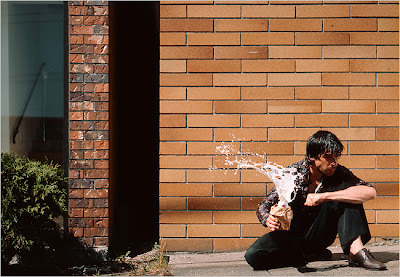 The photo titled "milk" amazes me as well : statics vs dynamics. Recently a friend sent me an article from Telegraph (?) about Wall's recent works - a photo titled Dressing poultry , am much less enthusiastic - subject too mundane may be?. Ah! I saw jeff wall in Chicago. Fabulous. BUt seeing them so small just doesn't give them the credit they deserve!